A Show Smart look is driven by smart design. This gravity defying DesignLine custom modular trade show display is sure to grab attention and help you drive more sales opportunities. For versatility that delivers a maximum return on your display investment this island exhibit reconfigures into a 20’ inline or a 10’ backwall. 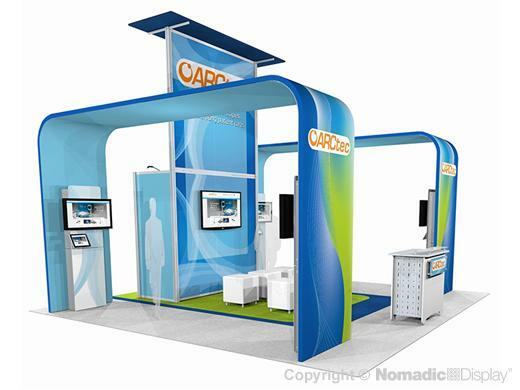 This trade show display design features tension fabric graphics, a theatre presentation area, AV workstations, iPad holders and walk-in storage. Plus it packs compactly into 4 FlatPack and 2 RollMax shipping cases.